Does the CIA covertly utilize “mind control” drugs and techniques? Are satanic messages subliminally hidden in popular music? Were Freemasons behind London’s Jack the Ripper murders? Did Kurt Cobain really commit suicide, or was he murdered? Did American astronauts really walk on the moon or was the whole event concocted on a sound stage? Does your vote really count or is the U.S. president chosen by secretive societies such as the Bilderberg Group, the Council on Foreign Relations, and the Illuminati? In an objective, fact-based manner, The Encyclopedia of Conspiracies and Conspiracy Theories thoroughly documents and explores these and other provocative questions. 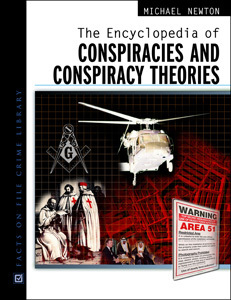 This intriguing reference provides more than 500 detailed entries that define the major conspiracies, both proven and unproven, throughout history. From the “inheritance powder” of the Medicis to the U.N. oil-for-food scandal, this encyclopedia investigates the broad history of conspiracies and their impact on global affairs and everyday life. Entries include biographies, specific events, profiles of groups, and thumbnail histories of notorious nations, each noting whether the conspiracy at hand is documented (BCCI, Project Paperclip) or speculative (alien abductions, New World Order) and offering concise analysis of the evidence and plausibility of those that remain unproved. "...would be a great addition to a library's collection." "Unlike most encyclopedias users will find that they want to read the entire book from cover to cover...this enticing volume is recommended for both public and academic libraries."